How to trash your legs in two days. I don't do a lot of double race weekends, but this past weekend I had 2 "must run" races back to back. The first on Saturday, the Central Park Challenge, is a big fundraiser for the organization I work for (YAI) and the 5K has become a favorite race to try to win an award. I have now 3 trophies and 1 age group plaque from the 4 years that I've been working there. 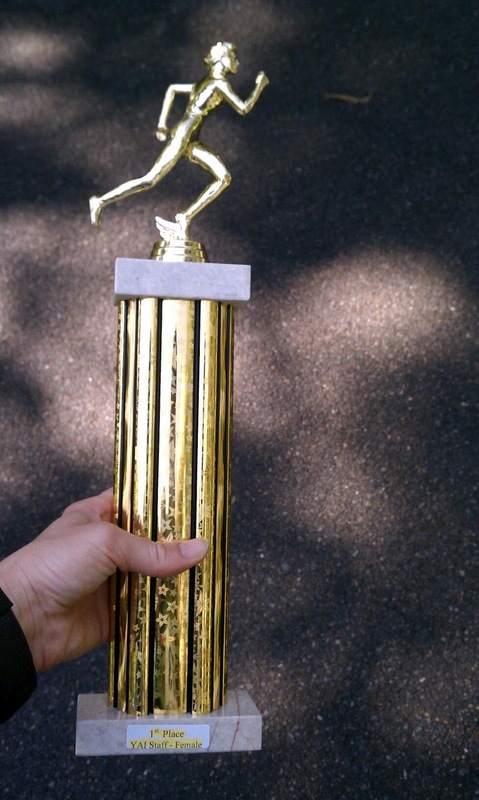 Now, to be honest it isn't a super competitive field and my trophies are for placing first in the Staff category, not overall or even age group (the plaque is AG). The field has definitely grown, this year had almost 1000 racers according to the announcer at the finish, but many of the racers are non-competitive or adults with disabilities or parents with children who attend YAI schools, etc. I had a good race numberswise, but it felt awful. I had a few glasses of wine the night before and that left my stomach in a delicate place for the race. I moved to the front of the race to avoid getting trapped behind the folks who don't understand that they shouldn't be in the front without any intention of running fast. This probably contributed to my first mile in the 6:30's. Deja vu, I did the same thing a few years ago. I got gradually a little slower as the drizzle stopped, the sun came out and the park became a steamy jungle. Yuck. Mental note: remember my inhaler for races. They had us link arms in the front row before the start. I look happy because we haven't started running yet. Overall I placed well, though I got smoked in my age group this year (7th/175) . I thought I might have been in the top 10 for women, but I was 12th. 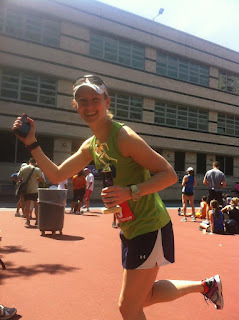 I felt terrible and ran a poorly paced race, so I went home feeling yucky and hot and unsatisfied. I had less than 24 hours to recover and get rested up for the next race. Action shot courtesy of Sharon. BIG thanks to the great folks at Van Cortlandt Track Club for a wonderful race- as usual! As the weekend was winding down last night, I was completely exhausted and my legs were creaking and screaming despite the ice bath, lots of rolling with the Stick and Biofreeze. 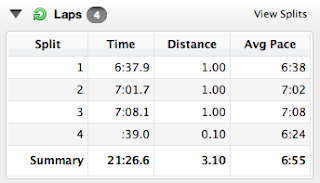 I was really satisfied with Sunday's race, but disappointed by my lack of pacing on Saturday. I know the 5K is not a specialty of mine, but I continue to barrel through. 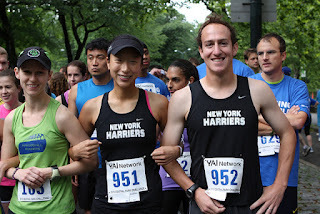 My next one is Thursday night at Van Cortlandt Park. I'll be running for a muffin as long as my legs are recovered. Right now they're on the mend and I'm definitely taking a rest day. I need to live closer to a very cold body of water for more frequent ice baths! Now, on to more swimming as the season approaches quickly! This Memorial Day weekend wasn't spent the usual way, lounging on the beach in South Jersey or swimming across lakes in the Adirondacks, instead we spent it out on the far west coast of Canada. My husband's parents live in Victoria, BC which I've only visited during the cool, rainy week around Christmas. Visiting in late May was a treat, the weather was beautiful -cold at night, 70's during the day and the city was in full Spring bloom. I've never seen such enormous and colorful rhododendrons. Wow. On Saturday morning, the day of my usual long run, I woke up at about 5:30am ready to go. Of course most people don't get out of the house quite that early to take the dog for a walk so I bounced around for 3 hours waiting to go run. The time change made the days seem really, really long out there. My stomach would tell me it was lunch time, but my watch said 9:00. Oops. Finally, we reached Elk/Beaver Lake where the family was going to take Finn, the old but loyal dog, for a walk while I ran the 10K loop. I was as excited as the dog to get out of the car and be unleashed. 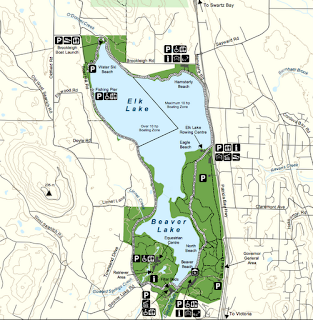 The trails around both lakes were well-groomed, wide and completely covered by archways of leafy green trees. It was beautiful and green and the sun reflecting on the lakes made them shimmer. I was in trail heaven. Until I got lost, but even that little 1.5 mile detour was along a pretty residential road shaded by tons of trees. I was following the km markers along the path when suddenly I couldn't find the next one. When I finally turned around and backtracked to where I lost the trail, I looked for a sign and confirmed that there was none. Oh well. I ran into a pair of guys running with their black standard Poodle and ran behind them for a while before passing the dog (she tried not to let me pass, it was funny) and joining them. As you would expect with Canadians they were friendly and helpful and had funny little accents. I told them I'd gotten lost and they said "It's impossible to get lost here". When I told them where I got lost they said "oh, except for that spot, oops". I stayed with them for the rest of the run until we hit the parking lots and we went separate ways. I love running (really athletics in general) because it's so easy to make quick friends and have easy conversation with total strangers. There's that instant "we're in this together" bond. 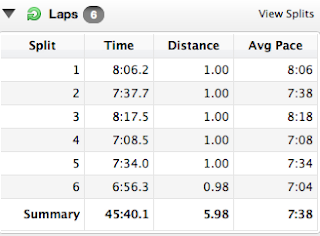 Anyhow, the 10K loop turned into about 8+ miles which was great for me.. I could have run another loop if I'd had the time. 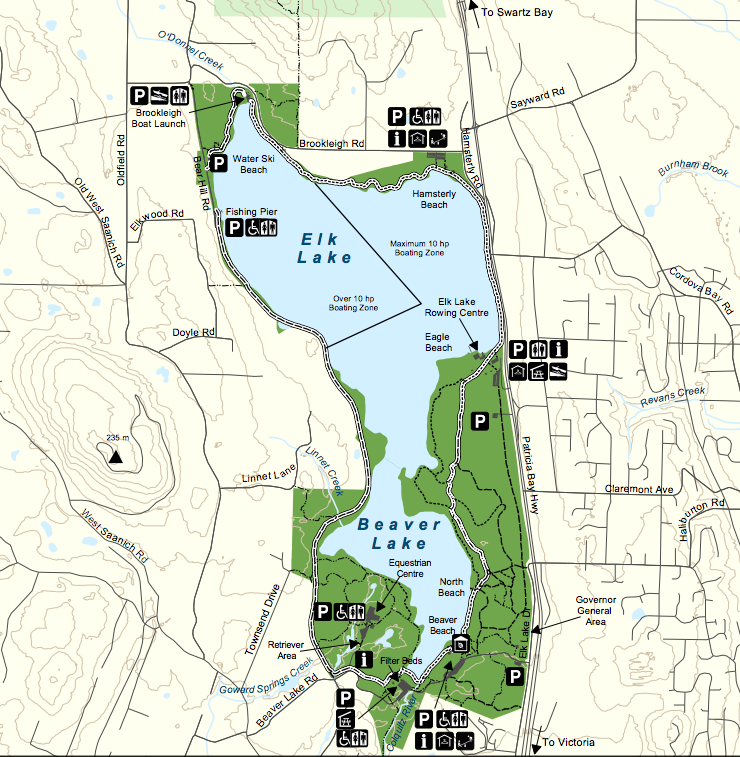 So if you ever find yourself out in Victoria, BC be sure to check out Elk/Beaver Lake - the most Canadian name they could come up with. 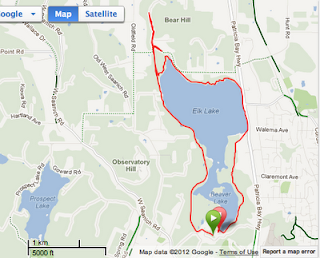 Here's the map of the trail and then the map of where I ran. Oops.